No matter how much of an animal lover you may be, you probably don’t want to share your living space with rodents. So what can you do if you find your home has been invaded by some little furry, scurrying ‘friends’ of the uninvited kind? If the thought of harming or killing a mouse makes you uneasy, then you will be glad to know that there are several excellent options when it comes to finding a humane mouse trap. These traps will safely capture one or more mice at a time and keep them secure and unharmed until you release them at a reasonable distance away from your house. A mouse, alive, caught in a no-kill trap. This article will discuss and explain what these traps look like, how they work, and what are the pros and cons for each one. This no kill mouse trap has been professionally designed and tested, and it specifically targets tiny creatures like mice; trapping them safely and effectively. The Havahart trap looks like a rectangular metal cage, with mesh along the sides, and a solid door on either end. It is made from strong non-rusting galvanized wire mesh which is durable both indoors and outdoors. Once the mouse is trapped inside it has plenty of space to move and good aeration through the mesh. This Havahart Cage Trap is easy to set up. To set it up, simply start by opening the door locks and setting the loop trigger rod. After that, you just have to turn the locks back to rest on the open doors. 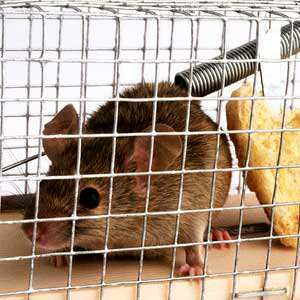 After placing a small amount of bait in the center of the trap, you are ready to catch a mouse. Put the trap flush against a wall where the mice can run through from either direction. As a mouse touches the trigger plate, both doors will drop down and lock firmly into position, keeping your mouse safe and sound until you come to set it free. This trap may also be set with only one door open, for example if you wish to place it in front of a mouse hole or entryway, ready to trap the mouse as it emerges from the hole. The main drawback with this Havahart Trap is that it catches only one mouse at a time. If you have lots of mice to catch, and you want to use no kill mouse traps, you would either need to buy several traps or keep on emptying it as soon as a mouse is caught. Otherwise there are many good points about this durable trap. Its sturdy construction means that it is made to last. Safety is also a priority, both for the user and the mouse; the solid doors and handle guards ensure that the mouse does not escape during transportation, while the smooth interior design prevents any injury to the mouse. This versatile trap requires no setting whatsoever and its slim line profile allows it to be slipped under or into tight spaces where mice are likely to go, and it can catch up to thirty mice at a time. The Victor Tin Cat is a fairly flat (1.75 inches high) rectangular box with two indented entrances on either side. The top surface is a lid which lifts up. Some models come with a clear lid so that you can easily see if you have a catch or not. The beauty of this no kill mouse trap is that it comes completely ready to go. You don’t even have to put any bait in it. Although, if you want faster results, you might want to give the mice something to snack on while they wait for you to come and release them. So all you have to do is place the Victor Tin Cat against a wall or baseboard, with the holes nearest the wall, and then wait for the mice to enter from either side. Once a mouse has entered, it will not be able to exit due to a lever which is triggered blocking the exit. By far the greatest advantage of this humane mouse trap is the fact that it can catch more than one mouse at a time – in fact up to thirty, although you would probably want to empty it way before it gets that full! The only slight disadvantage is that it may take the mice a while to get accustomed to the Victor Tin Cat. At first they may tend to hop right over it or run along the lid, but in due course they are sure to explore the little entry holes and then find themselves trapped inside. The Smart Mouse Trap is just that – it looks smart and it’s capable of catching even the smartest mouse with its simple and yet effective design. It looks like a little green house, complete with a pointed roof. It is made of transparent Kodar plastic with two stainless steel springs inside. First you need to place a small amount of bait in the bait compartment on the one end. The bait is in fact protected by a surface which has holes in it so that the mouse can smell but not actually get to the bait. When the mouse enters the trap, a spring loaded mechanism is triggered and this closes the door behind the mouse, keeping it safely inside. When you want to release the mouse somewhere away from your house, all you need to do is lift the food compartment door and let it run out. Besides the fact that this trap only catches one mouse at a time, another possible limitation for this trap may be its size and shape. The triangular roof may prevent you from being able to place it in every nook and cranny, but otherwise this is an effective and certainly humane trap. It is easy to empty, clean and reset for the next catch. Now that you have several options for some humane mouse traps, mouse traps that don’t kill, you can decide which one to try first – or try them all! Whatever you do, don’t forget to check the traps regularly and frequently. In due course, with these non-kill traps, you should soon be able to keep your resident mice securely under wraps.